During the past decade, single-use bioreactors have become widely accepted for use in cell culture process development and clinical manufacturing. Their key benefits over stainless steel bioreactors are flexibility, cost, and time savings associated with the reduction of cross-contamination risks (1). Here, we describe our approach to development and qualification of the Biostat STR single-use, stirred-tank bioreactor. Unlike other stirred single-use bioreactors, it offers a similar design to that of well-established, conventional (stainless steel) stirred-tank bioreactors. Disposability of the single-use cultivation chamber gives it robustness, reliability, and reproducibility of biological results together with a supply assurance needed to meet biopharmaceutical industry requirements. 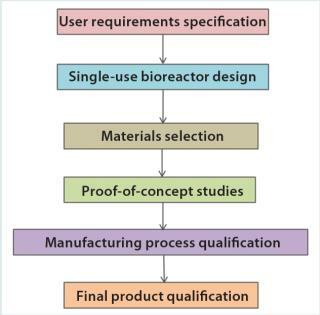 Development of a single-use bioreactor involves different phases of work (Figure 1). The starting point should be a clear definition of the product’s intended application. Typically, related requirements are captured in a user requirement specification (URS). On the basis of that initial input, the bioreactor design and material selection are then initiated. The proof-of-concept phase establishes component- and product-based tests that are predictive of the final application. Mechanical, chemical, and biological tests can be used to verify compliance with the URS during the prototype feasibility phase. Ideally, the production process should be qualified as well: Qualification efforts should cover production equipment, procedures, and parameters. Final product qualification can be based either on qualification of the individual components or the whole final product (or a combination of both) using mechanical and biological tests that emulate a specific intended application. Typically, this evaluation should be performed using bioreactor bags derived from regular manufacturing. All changes brought about (e.g., performance or robustness improvements) should be controlled by a stringent change-control process. When we initiated development of our new bioreactor, we started by defining the ultimate requirements that users of a disposable cultivation platform might expect from such a technology. Single-use bioreactors are increasingly used not only to make biological drugs for research purposes, but also for clinical trials and even commercial sale. Key requirements for such uses are listed in the box above. Limiting release of leachables from plastic materials into cell cultures and investigating their effects on the performance of cells in culture must be considered to ensure reproducible biological performance. Such substances can impede cell growth. Therefore, we used a risk-based approach during the material selection phase of our project, which covered all materials that would contact cells in culture. Other key requirements are sufficient mixing and oxygen transfer for cell culture applications. 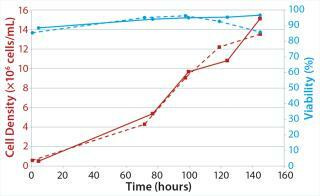 These are two basic bioreactor performance parameters to monitor during scale-up of a cell culture process to final production scale, often including transfer to other bioreactors such as existing stainless steel systems. Especially for cell cultivation on microcarriers (as is typical in vaccine production), the stirrer design provides good mixing while minimizing shear forces that can damage cells. Handling, installation, and disposal of single-use bioreactor bags should be easy and fast for end users. Installation of a robust bag design minimizes the risk of ruptures and punctures that can lead to contamination of cultures. With an increasing number of single-use bioreactors used for clinical and commercial production, assurance of component supply is absolutely critical to ensuring consistent drug quality and availability. Stirred single-use bioreactors are typically made of specific components such as film, stirrers, spargers, filters, tubes, connectors, and clamps. Suppliers of such systems often simply assemble components. Some such items come into contact with cell cultures directly, whereas others come into direct contact only with medium, feeds, and/or additives that are used to control pH. The components are often subject to sterilization by gamma irradiation. Each part of the final assembly must be designed from a form, fit, and function point of view to meet the requirements of its intended application (3). The characteristics of stirred, stainless steel bioreactors are well understood and represent a design that has been the bioprocess gold standard for decades. We designed the Biostat STR single-use bioreactor family (Photo 1) accordingly. Currently, the commercially available working volumes are 50 L, 200 L, 500 L, and 1,000 L (4). A 2,000-L system is in development. The system includes a stainless steel bag holder, a direct digital-control unit (DCU), and a single-use cultivation chamber (CultiBag STR). tions), with a convex bottom and a harvest port at the bottom base. Noack et al. detail of the single-use bioreactor design (5). Similar geometrical proportions and impeller types derisk process transfers between existing stainless steel bioreactors and the single use Biostat STR system (5). Different impeller configurations have been designed to meet specific requirements of different cell culture processes. On the basis of consultations with key users and a market review, we chose to provide two impeller options: two three-bladed segment impellers with a downward mixing direction and a six-bladed (Rushton) disk impeller at the bottom combined with a three-bladed segment impeller at the top. That three-bladed segment impeller has a stirrer-blade angle of 30°, and it generates an axial flow pattern for efficient mixing of the entire vessel content and suspension of cells/carriers at low shear rates (6). 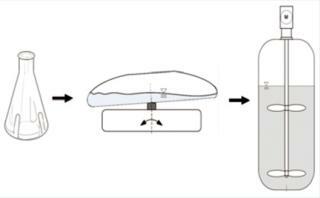 That feature makes the impeller suitable not only for suspension cell lines, but also for optimal support of cell culture using microcarriers (5, 7). The blades of the six-bladed disk impeller are arranged vertically along an agitation shaft. They generate a radial flow pattern and provide effective bubble dispersion. The ratio of the impeller’s diameter to the bag’s diameter is 0.38, which is comparable with typical 0.33–0.50 ratios of stainless steel fermentors (8). The sparger is installed below the bottom impeller to enable efficient gas transfer. Either a classical ring sparger with 0.8-mm holes or a microsparger with 0.15-mm holes can be integrated. A stainless steel bag holder supports the flexible, single-use cultivation chamber during cell culture. For optimum performance — e.g., with regard to heat transfer — the disposable bag needs to fit perfectly into its holding device. Caveats, pockets, and folds especially need to be prevented; they can be attributed to bad unfolding during installation of a disposable bag (4). Finally, a double-wall jacket in the lower part of the stainless steel bag holder provides effective heating and cooling. The Biostat STR system comes with fluorescence-based, single-use sensors for oxygen and pH measurement and control. Sensor patches are installed and sterilized with the cultivation bag. Modern single-use sensor technology ensures the same level of control that traditional sensors provide while preventing risky insertions of classical probes (5). But reusable probes can be inserted into a single-use bag through special probe assemblies for a culture control alternative. Because disposable bags are flexible, biosafety considerations are important for them. Pressure control is especially critical and can be achieved using a pressure sensor with critical process interlocks for shutting down aeration and deactivating all pumps at 50 mbar and activating an additional safety valve at 110 mbar. Disposable bioreactors have several components that are made of polymer resins. Raw material selection for individual components is guided by regulatory requirements, mechanical properties for the intended use, and biological performance. We considered typical guidelines applicable to polymeric materials that come into contact with final pharmaceutical products (e.g., requirements established for pharmaceutical packaging). Food industry and medical device guidelines may also help in assessing the suitability of a material for bioprocess applications (3). The “Relevant Guidelines” box presents examples of regulations that should be considered when qualifying raw materials of polymeric nature for single-use bioreactors. In addition to guidelines relevant to pharmaceutical products and medical devices, we had to take mechanical performance into account. Unlike single-use storage bags, CultiBag STR bags contain internal moving components (the agitation system), which are subject to substantial mechanical forces during transport, installation, and use. So mechanical properties of raw materials (e.g., hardness and tensile modulus) must be carefully considered — not only with regard to component performance (e.g., tensile strength) but also component manufacturing (e.g., melt flow index). Once components have been fabricated out of a selected raw material, they must be evaluated by testing, typically in a final assembly during the proof-of-concept phase. A key element in biopharmaceutical development is transfer of a cultivation process from laboratory to production scale while ensuring comparable process characteristics (9). Although it is impossible to keep all parameters constant during scale-up (10, 11), a design-space approach can support successful process transfer. However, scale-up of bioreactors and processes remains a challenge and is “as much an art as a science” (12). Therefore, extensive process understanding and knowledge of bioreactors and equipment used are prerequisites (13). During the proof-of-concept phase, we characterized the single-use bioreactor and determined a design space with regard to agitation and aeration rate. The most often applied bioreactor scale-up approach is based on similarity of geometry and process-engineering parameters such as impeller tip speed, specific power input per volume, mixing time, and volumetric mass transfer coefficient (14). Applying the same parameters to characterize single-use bioreactors as are typically used for reusable bioreactors enables scale-up within the CultiBag STR family and supports potential process transfers from and to conventional stainless steel bioreactors. Impeller Tip Speed: Mammalian cells have plasma membranes and lack cell wall structures, so shear rate as an agitation-related parameter has to be considered (15). The tip speed correlates to the maximum impeller shear rate. The maximum impeller tip speed of the CultiBag STR product family is 1.8 m/s, which agrees with the proposed maximum tolerable fluid velocity for mammalian cells (16) and is within the range of 1–2 m/s typical for cultivation of mammalian cells in glass and stainless steel stirred bioreactor (17). Tip speed is often used for scale-up in the pharmaceutical industry (18). Typically, basing scale-up on constant tip speed decreases specific power input when increasing to larger bioreactor scales. Specific power input per volume is one of the most important scale-up parameters described in literature (19, 20). Typically used impeller tip speeds in mammalian cell culture generate a turbulent flow pattern in bioreactors, which in turn is responsible for efficient suspensions of cells, homogeneous mixing of culture fluid, and dispersion of bubbles (21,22,23). We determined the power input for the STR family by measuring torque (5, 24) at the shaft element, which has become a standard method for conventional stirred bioreactors (25). Depending on scale, impeller configuration, and agitation rate, the resulting power input for the STR family is within a range of 1–220 W/m3. Although Henzler and Eibl et al. propose a maximum specific power input of 100 W/m3 to prevent cell damage (26, 27), Nienow suggests a higher range of ≤=250 W/m3 (28). 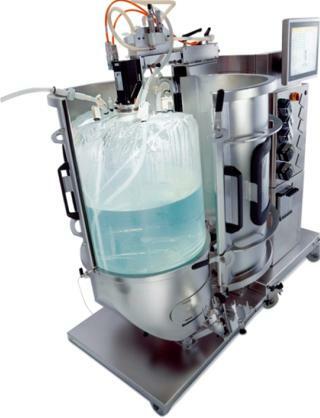 Mixing: Efficient mixing in large-scale single-use bioreactors is mandatory to prevent formation of concentration gradients and to ensure a homogeneous cell suspension. Inhomogeneous mixing contributes to formation of pH and nutrient gradients (29), which can reduce cell growth and protein expression (30,31,32). We determined mixing times using either the decolorization or the conductivity method (4, 5). For all scales of the STR family — and both impeller configurations — mixing times <30 s could be realized at tip speeds of ∼1.2 m/s. Volumetric Mass Transfer Coefficient: Oxygen mass transfer is another important parameter for successful cell cultivation. The oxygen demand of cells — in terms of optimum oxygen partial pressure and uptake rates — must be met by the oxygen transfer rate (OTR) of a bioreactor system. OTR is typically characterized by the overall volumetric mass transfer coefficient KLa, which is typically determined by a gassing-out method (5, 25). For all sizes and configurations of the STR family, KLa values are >10/h. For reference, the A-MAb case study suggests a KLa value of ∼8/h at a cell density of ∼15 × 106 cells/mL (33, 34). After a successful proof of concept, the final design was transferred to production. During this phase, we qualified the final production equipment, trained operators, and qualified our manufacturing procedures. The production equipment used in manufacturing determines the final-product quality of a single-use bioreactor. We qualified the complete equipment used for bioreactor-bag manufacturing and now monitor production parameters and requalify at regular intervals. All technical modifications to the final product are controlled by a stringent change-control process. Supply chain management is also part of an effective manufacturing process. Current regulatory guidelines and standards for quality systems such as ISO 9001 (35) instruct manufactures of single-use bioreactors to control components and services obtained from all subsuppliers. During supplier qualification, we critically review each company’s quality system, reliability, and general expertise in offering materials for pharmaceutical or medical applications. Most suppliers of raw materials for disposable bags that come into direct contact with process fluids have established a quality system that meets international standards such as ISO 9001, ISO 13485, or 21 CFR Part 820 (3). Design parameters specified and in place for all critical parts include critical dimensions and component delivery times. Arrangements between a bag manufacturer and its subsuppliers are critical for assembly of disposables and their functionality in use. Qualification at the final-product level is based on testing bags manufactured under regular production conditions. As a result, final-product quality as experienced at the application level is determined not only by individual qualification tests of components, but also by establishing a robust and quality-assured manufacturing process. Unlike plastic containers for pharmaceutical use, single-use bioreactors currently have no regulatory guidelines specifically developed for their qualification. Thus, our qualification approach for STR bags is based on relevant parts of existing guidelines associated with other products and general good manufacturing practice (GMP) principles. The elementary decision whether to qualify a product at component level or at application level depends on a manufacturer’s risk assessment. Often a combination of both approaches is preferred. For component-level qualification, test procedures are implemented for individual components. The qualification approach for an entire final product is based on verification of materials and assemblies during performance qualification testing at the application level. The complexity of a single-use bioreactor assembly makes it critical to test more than just its individual components. So a combined approach is the most meaningful and effective way to qualify such a system (3). Film Properties: Polymer films used in bioprocess applications are commonly multilayered in structure. Currently marketed films include a “backbone” and a contact layer. The former provides a barrier structure and is made up of one or more sublayers that determine its overall mechanical behavior and barrier properties with regard to oxygen, carbon dioxide, and water. The contact layer (which comes into contact with culture broth) must be inert and have good sealing characteristics (3). The “Film Qualification” box lists some examples of mechanical, physical, and chemical properties typically tested in accordance with regulations applicable to biopharmaceutical packaging (36, 37). The influence of substances leached from polymer films on the growth and productivity of mammalian cells is a major concern with single-use bioreactors. Because Stedim 40 film has been successfully established in biopharmaceutical applications such as media and intermediate storage for years, we use it for the CultiBag STR family as well. In addition to the US Pharmacopeia chapters <87> and <88>, we also chose an application-driven approach to evaluate the film’s biological compatibility. To investigate potential effects of our film on cell growth and viability, we applied a biological test model based on batch cultivation of a mammalian cell line. 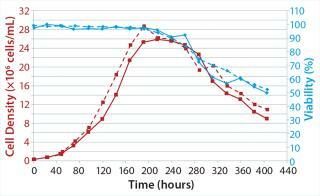 In that study, we compared cell growth in single-use bioreactor bags with the growth behavior in a glass bioreactor. For film qualification, we selected a bioreactor test system using a Biostat RM 20∣50 optical bioreactor with a two-dimensional CultiBag RM 10-L optical culture bag made from Stedim 40 film. With the rocking principle of this particular single-use bioreactor, we could use a minimum culture volume to create a worst-case ratio of culture volume to the inner bag surface. Our reference was a Biostat B unit with a standard borosilicate glass vessel. We performed a batch cultivation using PER.C6 Ep.CAM cells from Crucell NV grown in CDM4 PER.MAb medium supplemented by 4 mM L-glutamine from Thermo Scientific HyClone. Typical final cell densities >10 × 106 cells/mL were reached. The first “Cultivation Parameters” box summarizes the cultivation parameters we used for both bioreactor test systems. And Figure 2 depicts growth characteristics obtained with the CultiBag RM 10-L optical bioreactor made of Stedim 40 film and the Biostat B glass vessel. In both systems, cell growth behavior (specific growth rates and viable peak cell densities >12 × 106 cells/mL) and viability were comparable, indicating no negative influence from the film. Users have confirmed these results (data not known) with a broad range of cell lines using the first Biostat STR bioreactor sizes (launched in 2009). No adverse cell culture results have been reported. Qualification of Assemblies: We qualified the connections among individual components of our single-use bioreactor to demonstrate physical and mechanical integrity of the final bag assembly. We also qualified seal strength and integrity (e.g., of the film–film and film–port weldings) to demonstrate reliability, reproducibility, and robustness. And we decided to qualify the robustness on both the final-product (see below) and component levels. To verify robustness on a critical-component level, we designed a special test — the “water-burst test” — to evaluate the stability of critical welds. Simplified small bags containing critical welds were created for this study. We filled them with water using a pump and compared the fill volume up to bursting against the nominal volume. On average, a water-fill of 133% the nominal volume could be reached before the model bag burst. Similarly, we qualified the component assembly by testing its integrity, connection tightness, and ease of assembly. Bioreactor Bag Robustness: Considering the intended application of our product, we specifically developed a robustness verification procedure for the CultiBag STR family. This involved verifying robustness on the critical-component (e.g., within the water-burst test) and final-product levels. In the latter studies, we qualified robustness and handling of this new single-use bioreactor format. For the bag qualification, we tested a representative number of bags based on a worst-case rationale. The worst case assumed that the larger-scale bioreactor bags — and therefore all components and seams (500 L and 1,000 L) — would be exposed to substantial mechanical forces significantly larger than those of the smaller sizes (50 L and 200 L). Further, we performed robustness trials on the 50-L and 200-L sizes with fewer bags. Additional robustness trials at 1,000-L scale are routinely performed on bags from regular production to confirm the results of initial qualification tests. We chose the parameters of our robustness trial based on typical characteristics of a mammalian cell culture process. The trials ran for 21 days at maximum filling volumes, 40 °C, and 30-mbar overpressure. Then we conducted aeration and pressure stress tests after that 21-day period. Table 1 shows the applied agitation rates, which depend on impeller configuration and CultiBag STR sizes. Visual inspection of seams is performed before installation of each bag into a stainless steel bag holder. We tested the sparger and overlay aeration of the single-use bioreactor, and the third part of our robustness trial was a pressure stress test. During robustness qualification and routine testing, we evaluated a pressure of ≤=50 mbar. We also performed a worst-case pressure stress test on a number of bags, in which we increased the pressure in 10-mbar steps from 30 mbar to 110 mbar (Figure 3). Every pressure step increase remained constant for one hour. After the robustness trial, we performed a second visual inspection of the entire bag, all seams, and the agitation system. Further, for a number of bags, we also performed a color invasion test. Table 2 lists the defined pass criteria for these robustness trials. Biological Qualification Using a Model Cell Line: Another important element of qualification at the final-product level is to prove full functionality for the bioreactor’s intended use. We demonstrated that through successful cultivation of an industrially relevant model cell line using a modern, state-of-the-art fed-batch process. Specifically, we grew a recombinant CHO (DG44) cell line from Cellca expressing an IgG1 antibody in PM-5 medium from SAFC with optimized feeds. For reference, we used a Biostat D-DCU 10-3 stainless-steel fermentor with a 10-L working volume and 3:1 height/diameter ratio. In both bioreactor systems, we applied a fed-batch process with bolus feed additions. A two-step seed expansion began in shake flasks, followed by batch culture in the CultiBag RM 10-L optical bioreactor (Figure 4). The shake-flask cultures used SMD-5 media from SAFC at 36.8 °C with 7.5% CO2 and a humidity of 85% in a Sartorius Certomat CTplus CO2 incubator. After three days, we transferred cells into the CultiBag RM 10-L optical bioreactor with cultivation conditions summarized in the “Cultivation Parameters: Seed Expansion” box. Cells were subsequently transferred either to the CultiBag STR 50 system or the Biostat D-DCU 10-3 unit. The “Cultivation Parameters: Fed-Batch Culture” box lists cultivation parameters of the full-scale run in each. Cell growth behavior was comparable in both systems. Specific growth rates, viable peak cell densities (>26 × 106 cells/mL) and viabilities were similar (Figure 5). IgG concentration in both test cultures reached ∼6 g/L (data not shown). In addition to the qualification approaches for robustness and biological performance mentioned above, single-use bioreactor vendors typically use tests described by US and the European pharmacopoeial monographs. We also used guidelines described in the “Physicochemical Qualification” and “Biological Qualification” boxes to qualify gamma-irradiated CultiBag STR cultivation chambers, documenting the results in a validation guide. We also qualified packaging and aging in accordance with ASTM D 4169 and ASTM F 1980, respectively. The Biostat STR single-use bioreactor family is unique in its design and performance in that it is similar to conventional, stainless steel, stirred-tank bioreactors. For disposability, however, the cultivation chamber uses different materials, specific components, and sometimes novel technologies (e.g., single-use sensors). Development and qualification thus required a number of new and specific tests to ensure robust and reliable performance and lot-to-lot consistency. Robustness, performance, and quality of this new disposable bioreactor family primarily come from selecting suitable materials and manufacturing by a well-defined and controlled process to ensure that critical quality attributes (CQAs) are consistently met. We established intelligent, application-driven qualification approaches performed on both the component and final-product levels to emulate the intended application of this advanced single-use bioreactor platform. Its full functionality and consistent and reproducible performance were confirmed during performance qualification of the final product. Biological compatibility was proven through mammalian cell culture trials, in both a model system based on two-dimensional bags and the final design. Reproducible robustness was confirmed by worst-case trials and pressure tests. As all single-use bioreactor vendors do, we performed our testing according to US and European pharmacopoeial monographs. Finally, the qualification of the Biostat STR single-use bioreactor family verified that it consistently met the URS we defined at the starting point of product development. Our risk-based approach of testing at both the component and final-product levels for the intended application led to successful development of a robust, single-use bioreactor. Highly comparable with existing stainless steel bioreactors, it also meets industry requirements for quality standards and assurance of supply. Susanne Gerighausen is director of quality; and Gerhard Greller is R&D director of upstream technology at Sartorius Stedim Biotech GmbH, August-Spindler-Straße 11, 37079 Göttingen, Germany; 49-551-3080; www.sartorius.com. Biostat and CultiBag are registered trademarks of Sartorius Stedim Biotech. PER.C6 is a registered trademark of Crucell NV. 1.) Eibl, R, C Löffelholz, and D. Eibl Eibl, R and D. 2011.Single-Use Bioreactors: An OverviewSingle-Use Technology in Biopharmaceutical Manufacture, John Wiley & Sons, Inc., New York:33-51. 2.) Morris, L. 2004. The Risk Management Mandate. Pharmaceut. Exec. www.pharmexec.com/pharmexec/PE+Features/The-Risk-Management-Mandate/ArticleLong/Article/detail/95093.. 3.) Barbaroux, M, S Gerighausen, and H. Hackel. 2013.Advances in Biosciences: Approach to Quality and Security of Supply for Single Use Bioreactors. 4.) De Wilde, D. 2009. Bridging the Gap from Reusable to Single-Use Manufacturing with Stirred, Single-Use Bioreactors. BioProcess Int. 8:S36-S41. 5.) Noack, U Eibl, R and D. 2011.Single-Use Stirred Tank Reactor BIOSTAT® CultiBag STRCharacterization and Applications. Single-Use Technology in Biopharmaceutical Manufacture, John Wiley & Sons, Inc., New York:226-240. 6.) Fenge, C. 1993. Agitation, Aeration and Perfusion Modules for Cell Culture Bioreactors. Cytotechnol. 11:233-244. 7.) Chaubard, F. 2010. Disposable Bioreactors for Viral Vaccine Production: Challenges and Opportunities. BioPharm Int. supplement; http://www.biopharminternational.com/biopharm/Disposables/Disposable-Bioreactors-for-Viral-Vaccine-Productio/ArticleStandard/Article/detail/695153.. 8.) Marks, D. 2003. Equipment Design Considerations for Large Scale Cell Culture. Cytotechnol. 42:21-33. 9.) Vorlop, J, and J. Lehmann. 1988. Scale-Up of Bioreactors for Fermentation of Mammalian Cell Cultures, with Special Reference to Oxygen Supply and Microcarrier Mixing. Chem. Eng. Technol. 11:171-178. 10.) Xing, Z. 2009. Scale-Up Analysis for a CHO Cell Culture Process in Large-Scale Bioreactors. Biotechnol. Bioeng. 103:733-746. 11.) Varley, J, and J. Birch. 1999. Reactor Design for Large Scale Suspension Animal Cell Culture. Cytotechnol. 29:177-205. 12.) Ma, N, JJ Chalmers, and M. Mollet Ozturk, SS and WS. 2006.Aeration, Mixing and Hydrodynamics in BioreactorsCell Culture Technology for Pharmaceutical and Cell-Based Therapies, CRC Press, New York:225-248. 13.) Catapano, G Eibl, R. 2009.Bioreactor Design and Scale-UpCell and Tissue Reaction Engineering, Springer, Berlin-Heidelberg:173-262. 14.) Löffelholz, CDynamic Single-Use Bioreactors Used in Modern Litre and m3 Scale Biotechnological Processes: Engineering Characteristic and Scaling-Up. 15.) Rathore, AS. 2008. Modelling of Biopharmaceutical Processes, Part 1: Microbial and Mammalian Unit Operations. BioPharm Int. June:56-65. 16.) Chisti, Y. 2001. Hydrodynamic Damage to Animal Cells. Crit. Rev. Biotechnol. 21:67-110. 17.) Fenge, C, and E. Lüllau Ozturk, SS and WS. 2006.Cell Culture BioreactorsCell Culture Technology for Pharmaceutical and Cell-Based Therapies, FLCRC Taylor & Francis Group, Boca Raton:155-224. 18.) Kaiser, SC Minin, IV and OV. 2011.CFD for Characterizing Standard and Single-Use Stirred Cell Culture BioreactorsComputational Fluid Dynamics Technologies and Applications, InTech, New York. 19.) Maigetter, RZ. 2010.Single-Use (SU) SystemsEncyclopedia of Industrial Biotechnology: Bioprocess, Bioseparation, and Cell Technology, John Wiley & Sons, Inc., New York. 20.) Eibl, R, and D. Eibl Dutta Gupta, S and Y. 2006.Design and Use of the Wave Bioreactor for Plant Cell CulturePlant Tissue Culture Engineering, Springer, Dordrecht:203-207. 21.) Eibl, D, T Peuker, and R. Eibl Eibl, R and D. 2010.Single-Use Equipment in Biopharmaceutical Manufacture: A Brief IntroductionSingle-Use Technology in Biopharmaceutical Manufacture, John Wiley & Sons, Inc., Hoboken:145-148. 22.) Merseburger, T. Eibl, R and D 2010.An Introduction to the Validation and Qualification of Disposables Used in Biomanufacture — A User’s PerspectiveSingle-Use Technology in Biopharmaceutical Manufacture, John Wiley & Sons, Inc., Hoboken:159-172. 23.) Langer, E. 2012.9th Annual Report and Survey of Biopharmaceutical Manufacturing Capacity and Production: A Study of Biotherapeutic Developers and Contract Manufacturing Organizations, BioPlan Associates, Inc., Rockville:243-336. 24.) Holland, IA, and FS. Chapman. 1966.Liquid Mixing and Processing in Stirred Tanks, Reinhold, New York:1-28. 25.) Löffelholz, C. 2013. Bioengineering Parameters for Single-Use Bioreactors: An Overview and Evaluation of Suitable Methods. Chem. Ing. Tech. in preparation.. 26.) Eibl, R, and D. Eibl Kasper, C, M and R. 2009.Application of Disposable Bag Bioreactors in Tissue Engineering and For the Production of Therapeutic AgentsBioreactor Systems for Tissue Engineering, Springer, Berlin-Heidelberg:183-207. 27.) Henzler, HJ. 2000. Particle Stress in Bioreactors. Adv. Biochem. Eng. Biotechnol. 67:35-82. 28.) Nienow, AW. 2006. Reactor Engineering in Large Scale Animal Cell Culture. Cytotechnol. 50:9-33. 29.) Langheinrich, C, and A. Nienow. 1999. Control of pH in Large-Scale, Free Suspension Animal Cell Bioreactors: Alkali Addition and pH Excursions. Biotechnol. Bioeng. 66:171-179. 30.) Nienow, AW. 2010.Impeller Selection for Animal Cell CultureEncyclopedia of Industrial Biotechnology: Bioprocess, Bioseparation, and Cell Technology, John Wiley & Sons, Inc., New York. 31.) Osman, JJ, J Birch, and J. Varley. 2001. The Response of GS-NS0 Myeloma Cells to pH Shifts and pH Perturbations. Biotechnol. Bioeng. 75:63-73. 32.) Osman, JJ, J Birch, and J. Varley. 2002. The Response of GS-NS0 Myeloma Cells to Single and Multiple pH Perturbations. Biotechnol. Bioeng. 79:398-407. 33.) Hu, WS. 2005.Oxygen Transfer in Cell Culture BioreactorsAdvanced Training in Cellular Bioprocess Technology (CD-Rom), Indian Institute of Technology Department of Chemical Engineering, Bombay. 34.) CMC Biotech Working Group A-Mab: A Case Study in Bioprocess Development (Version 2.1). 35.) 2008.ISO 9001: Quality Management Systems — Requirements, International Organization for Standardization, Geneva. 36.) Barbaroux, M, and A. Sette. 2006. Properties of Materials Used in Single-Use Flexible Containers: Requirements and Analysis. BioPharm Int. www.biopharminternational.com/biopharm/article/articleDetail.jsp?id=423541&sk=&date=&pageID=2:18-29.
posable Bags: A Manufacturer’s ReportSingle-Use Technology in Biopharmaceutical Manufacture, John Wiley & Sons, Inc., New-York:114-134.